Surely I’m not the only one who’s noticed the Pacific Northwest Hipster vibe creeping into Mennonite communities. Specialty coffee. Bushy beards. Donald Miller books. Artsy hole-in-the-wall restaurants. Flannel shirts. Adventuring. On and on. Am I the only one who finds it odd? I’ve always liked PNW culture, but I never expected it to become “cool.” Not in the non-Menno world, and ESPECIALLY not in the Menno world. But it has, to the point where a Facebook photo showed up in my feed of an artsy Mennonite band from back east where one member is wearing a Powell’s Books t-shirt. Probably the main reason I find this PNW appropriation so weird is that I live in an ACTUAL Mennonite community in the ACTUAL Pacific Northwest, and here, hipster culture just isn’t a thing. Yes, you could argue that my friends and I have adopted some of the hipster traits we like–wearing weird thrift-store clothes, going hiking, hanging out at coffee shops, etc–but as a whole we are the outliers, and the Mennonites as a whole aren’t into that. It’s not “cool” here unless you’re outside the Menno bubble and probably also in a city somewhere. So yeah, I find it weird. Not bad, just odd. But here’s what I think: If you have an obsession with PNW culture, you should move to the actual Pacific Northwest. You’ll be a part of the culture instead of just appropriating it. The nature thing is legit. Start an outreach church. Portland is the most non-religious city in America. Okay, for real though, we’re just kinda lonely out here in our little disconnected Mennonite community. So bring your friends. What do you think of the hipster Mennonite trend? Have you noticed/participated in it? This entry was posted in Thoughts About Life and tagged culture, hipster, mennonite, Pacific Northwest, PNW. Bookmark the permalink. I loved this post! Probably won’t move out there! I don’t own a flannel shirt. Maybe someday in our wanderings, we will make Oregon! I think my son Austin, spent one summer studying in Eugene with SIL! Sounds like you value authenticity. I remember living in Farmington, NM and a guy showed up from back east. It wasn’t long until he traded his Nike’s for cowboy boots, his baseball cap for a cowboy hat, and his cargo pants for purple jeans. Taught me a lot, that jeans thing did. I love that I can easily buy my kind of food here in Washington. Nearly every grocery store has a good selection of organic, bulk, gluten-free and international foods. It’s going to be a hard adjustment when I move back to Pennsylvania. And it’s definitely the in thing here to be active – hiking, biking and more. Ryan has always found obscure bands, I’ve been shopping primarily at thrift stores for the past ten years, we were coffee geeks since we started making our own coffee… Together, we look pretty hipster. But we giggle because it’s just pretty convenient that the way we like to do things makes people think we’re cool at the moment. 🙂 And I think I know the band and dude you referenced… He actually spent a year living on the west coast, and happened to love Powell’s. I’m fascinated by Mennonite hipsters because I think Mennonite culture is in itself pretty hipster. But I totally hear you on the appropriating culture thing. We want to come visit for the coffee culture and the varied topography, so we’ll definitely take you up on the invitation! Hope this doesn’t sound like a defensive “not all Mennonites” reply. Your writing is, as always, humorous and insightful. No, it doesn’t sound like a defensive “not all Mennonites” reply, but even if it did I’d gladly welcome it over the bizarre off-topic comments peppering my Facebook post. Also, thanks for making me eat my words with Powell’s guy 🙂 Weird that he lived out here and I didn’t know him. And yes, I got told in college that Mennonite was “such a hipster religion,” which is part of the reason that actual hipster Mennonitism is so interesting to me. Haha! Nice. 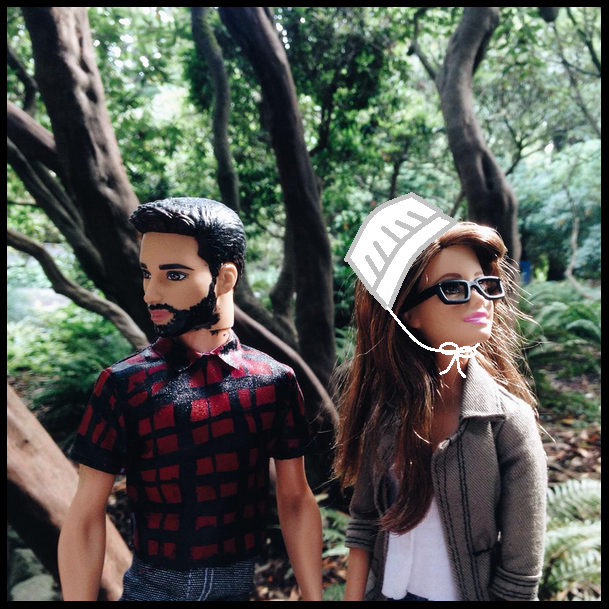 🙂 I’m especially loving those hipster/Menno Barbies. Except for Hipster Huntley’s arms over there. Seriously. Waay too skinny. Does that boy sip kombucha all DAY? I just thoroughly enjoyed this post. From the barbies to the Bible school. It was really good.